There are lots of opinions on energy, but only one most acceptable conclusion to a discussion of what actions should be pursued - it is some variation on, "and of course efficiency, we have to do all the the conservation we can first." This signals everybody to nod approvingly and terminates the discussion. I don't agree - which is a difficult position given the culture that views any energy analysis with the assumption "efficiency" (often used interchangeably with "conservation") is the most effective way to reduce costs. In this post I'll challenge the usefulness of a perspective that values negawatts above megawatts. Before moving to some foreign data from the American Energy Information Administration (EIA), I'll introduce a graphic showing both official estimates of a levelized cost of energy (LCOE) for efficiency in Ontario, and the LCOE I estimated of available but not utilized cheap supply. I've added trend-lines to emphasize that while I find the cost of efficiency was higher than foregone supply until 2015, the claimed LCOE has dropped quicker and appears cheaper than the foregone supply in recent years. I'll need to cover a lot of ground before arriving at a place to explain why that is. showing cost of [un]Fair Hydro Plan is also a positive - but also doesn't address costs. While I was initially underwhelmed by the changes described by the Minister, having now reviewed the extensive material posted due to yesterday's announced changes I need to correct the misinformation I posted, and be more appreciative of some of the other changes. In preparing my previous post I created a graphic posted separately on Facebook and Twitter. The graphic got more views than the post I edited it out of. Comments on the original graphic included thoughts from the "electrify everything" perspective. I responded with too much caution, noting shrinking supply. Having given topic some more thought, I've added dumped exports as supply that has been available to Ontarians over the past years, on top of curtailed potential supply and under-utilized gas generators. 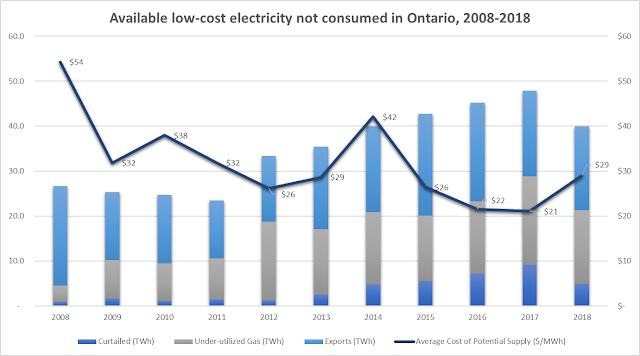 In this post I hope to provide some context to the graphic, and show why coming changes in supply don't present a challenge for meeting Ontario's annual electricity needs, if not its capacity requirements. Data - and lots of it. While I'll try to prevent this post from sliding into an abyss of Ontario electricity statistics, I'll be citing provincial data as the basis for discussion about public understanding being restricted by the presentation of data from official sources, and present new views of generally unreported data that would benefit literacy in valuations of electricity sources - an area where reckless ignorance blooms again and again. but enough about academics, let's dive in! The old standard of valuing generation sources is the Levelized Cost of Electricity (LCOE ). I was particularly pleased in late 2015 when a report from Ontario's Auditor General included a figure (5) indicating the cost and quantity of energy sources for 2014. I was more pleased a few years later when I received figures from a freedom of information (FOI) request with the same information for years 2007-2015. While I think the data is terrific, when I wrote about it I cautioned on presenting LCOE, "stressing these calculations deserve a big asterisk and lengthy footnote on the impacts of things such as curtailment and capacity payments." I have now done the data work required to add that lengthy footnote on curtailment and capacity payments. I am certainly not unique in hoping for superior valuation tools to LCOE: the U.S. Energy Information Administration (EIA) has developed a Levelized Avoided Cost of Electricity (LACE) metric, and the International Energy Agency (IEA) a Value-Adjusted Levelized Cost of Electricity (VALCOE - see pg 41). LACE is intended to value the cost (of alternatives) avoided by the generation, with the intent LACE > LCOE would signal a good project. VALCOE attempts to recognize the different capabilities of sources in providing firm capacity and flexibility. The specifics are less important than the principles: not all generation is of equal worth to systems that are intended to minimize loss-of-load situations. Concrete examples of LUEC's limitations will help conceptualize the issues that have people looking for better valuations. Before I discuss my data I will note one other frequently cited source of Unit Cost in my province (I regard LUEC and LCOE as interchangeable terms): the Ontario regulator. Their most recent explanation of regulated rates includes a table (3) indicating hydro at 6.2 cents per kilowatt-hour, nuclear at 7.7, wind at 15.9, gas at 18.8 and solar at 51.3 c/kWh. I'll show replacing the OEB list's lower cost supply with gas is likely to lower total costs. I have collected hourly data for the transmission-connected (Tx) generators reported by Ontario's system operator, including imports, and I've estimated (hourly) distribution-connected generation (Dx), curtailed supply, and contracted cost, either by unit generated (or curtailed), or by capacity required to be available. My base union query in working the data has over 16.4 million records. I will not repeat the word "estimate" in this post but simply note this one time it may be applied to everything (my work and the numbers from the IESO and OEB I cite). 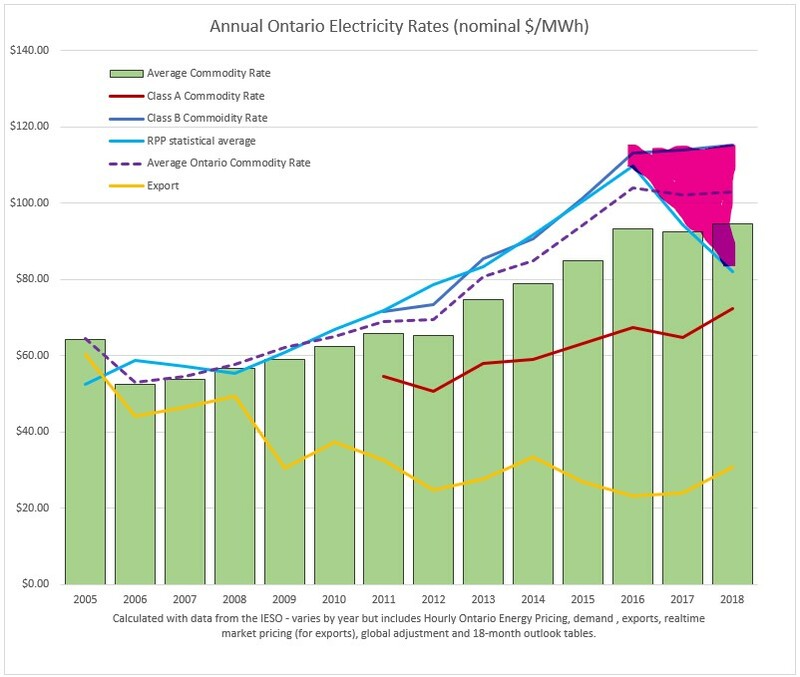 Two notable aspects of 2018's electricity numbers in Ontario: average rates did not substantially increase, and demand did. Both of these buck the trend of the past decade. I'll explain how the trends broke. 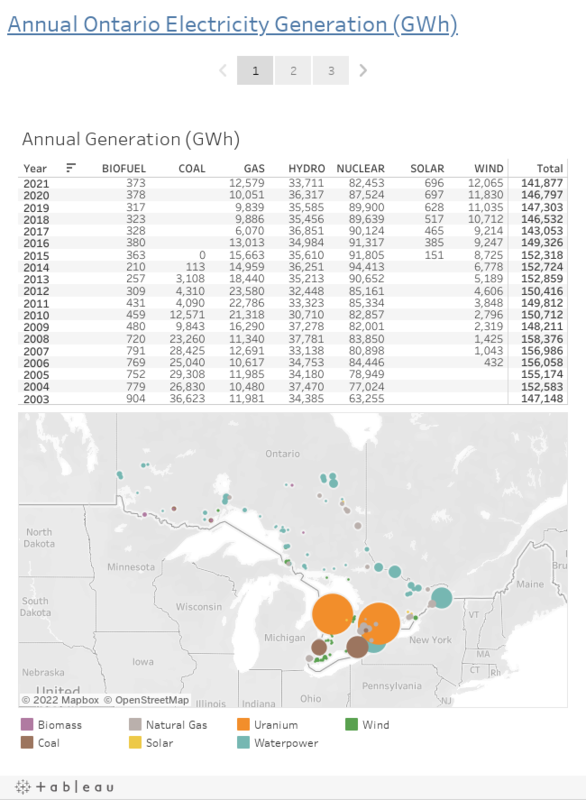 I saw an opportunity for presenting Ontario electricity data in trying out the free public version of the Tab|eau business intelligence tool. I'm not sure I have the patience, or the smarts, to learn how to do all I've learned with Microsoft's Power BI, but maybe I should. I'm astonished with the power of this map in filtering the data table! The big deals of the early Christmas shopping season are coming to an end soon, so it’s a little late for advising on purchases, but I have been looking at some product and thought a post on what, and why, might be of interest. Like some - if not many - when I think gifts I think of addressing energy consumption, the new technology of a smarter “internet of things” (IoT), and emissions from energy use. Having served a decade in retail some time ago, I also think of selling as much as buying. Some background on my electricity consumption history. Our current home uses much less electricity than it did when we arrived a decade-and-a-half ago. I wrote on the house early in 2015 after we’d received natural gas and installed a forced-air furnace and my beloved gas stove. A quick narrative for the chart: from 2004 to 2007 the living space grew considerably (30+%) - efficiency improved although consumption doesn’t show it. Then the wood stove years began (about 3 full cords a years) and more of the house was renovated/insulated. At the end of 2014 gas arrives (we consume 1000-1100 cubic meters a year), and wood consumption is halved. The blip up in 2017 was due to a project by another member of the household (quite a productive one), which ended early this year and consumption is falling back accordingly. 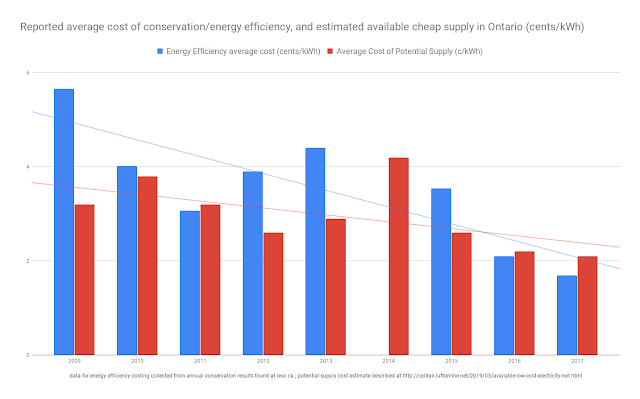 Electricity consumption is above the average for Ontario homes, but there may be very few homes at that average as those that heat water with electricity (as I do) are likely above average, and others probably below. 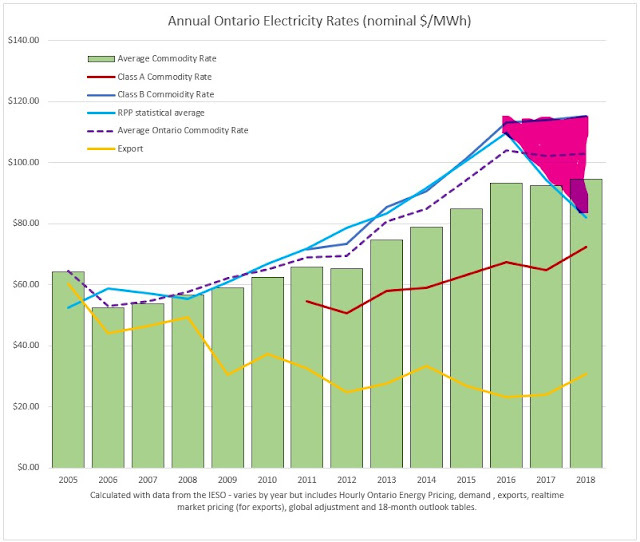 The graphic illustrating trends in electricity pricing in Ontario will be more impactful with some explanation. First I'll deal with the terminology housekeeping, allowing for some discussion of the trends. Exporters pay only a real-time market price (RTP) for supply. The Class A commodity rate is calculated as the statistical average Hourly Ontario Energy Price (HOEP) plus the average global adjustment for the class (total Class A charges divided by consumption). The Class B commodity rate is calculated as the weighted average HOEP plus the average global adjustment rate for the class. The global adjustment in my estimates differs slightly from figures reported by the IESO as global adjustment figures are publicly disclosed at gigawatt-hour level (GWh), while I expect the IESO calculated at a finer level of detail. Exporters do not pay the global adjustment, and they settle at the real-time price (RTP) for particular jurisdictional interties, not the HOEP. As I only have RTP data from 2010 on, the figures from 2005 to 2010 are based on the HOEP which effectively underestimates the average cost. From other data (including this) it is known the actual average intertie-specific RTP value realized on exports was about 10% higher than the HOEP value during those years. 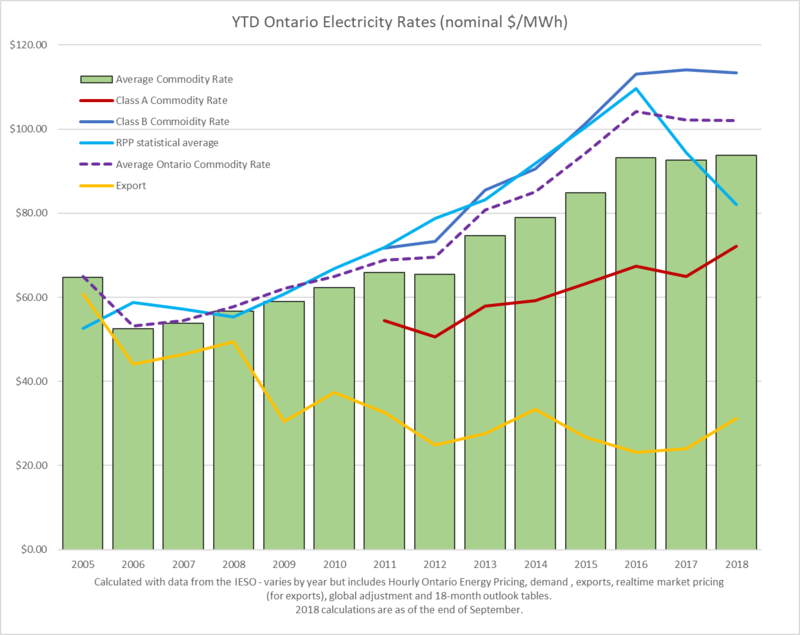 Two average rates are shown: the average for Class A and B (or, prior to the introduction of the classes in 2011, simply the Ontario average) is shown as the "Average Ontario Commodity Rate", and the "Average Commodity Rate" which also includes exports. Those averages are all weighted according to the consumption of each consumer class. Notably, RPP rates are not in the average calculations (as they should simply be a different type of Class B rate).